Statistical Characterization from Ultrasonic Signals Using Time  Frequency Representation. Tecnología de Materiales, Unidad de Ensayos No Destructivos. In this paper a mixed methodology is presented to classify discontinuities in steel, following the "feature mapping" philosophy. 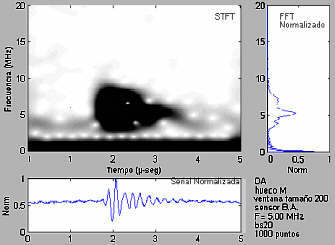 Some results are presented using STFT (Short Time Fourier Transform) technique. The ultrasonic signals were obtained by reflection in three kind of ideal reflectors (flat bottom holes DA type, slits DC type and side drilled holes DB type). In all cases, broadband and narrowband longitudinal wave transducers were used. The signals were digitalized and stored, using a signal acquisition system developed in our institution, based in VEEPRO Ň system. A Time-Frequency representation is obtained using a STFT technique to determine the proper frequency bands from researched discontinuities. Afterward, a filter bank was implemented in the same frequency band. Several signals with a reduced frequency content from every analyzed signal were obtained. Finally a statistical procedure (dendograms) based in cluster analysis is used and fourth order momentum (kurtosis) is obtained as the best estimator to differentiate volume defects from plane defects, using the furthest neighbor as proximity measure. The ultrasonic testing is one of the techniques of Non Destructive Testing (NDT) more used for detection and sizing of discontinuities in different materials. However, sometimes the obtained signals are difficult to evaluate, since they depend on many factors like the sensor beam diameter, the sensor fundamental frequency, the beam angle of incidence, the depth and defects orientation, etc. At the moment, only very experienced operators can make a good evaluation of results. A considerable demand has been observed in the search of tools that helps inspectors in the measurement and defect classification. The present work is based on the application of the spectral analysis of ultrasonic signals, used decades ago . Initial studies driven by Rose, et al. in the 80's [2-4], has introduced the concept of using statistical and physical knowledge to extract additional characteristics in the sampled signals. Indeed, this philosophy should allow to differentiate one defect from another. This concept is based on the hypothesis the received signal should be unique for each defect type, and therefore, it should have characteristic that differentiate it from the others. These characteristics should be obtained (in principle), using advanced statistical methodologies and appropriate tools in a proper way. The motivation of the present study, was based on the use of concepts introduced by Rose , combined with the extraction of some of the presented ideas of later studies developed in the 90's decade. Among those can be mentioned the studies published by Bilgutay, et al., where the well-known technique Split Spectrum Processing (SSP) [5-13] was developed. This technique was created to distinguish the response from discontinuities in austenitic materials (stainless steels), in signals with strong presence of grain noise. The SSP consists of two parts: decomposition and composition. The decomposition is performed using filters bank. It consists of a series of pass-band filters decomposing the signals spectrum in bands within certain frequency values. These values previously established, should embrace the complete signal frequency range. Then the composition makes the inverse Fourier transformation and introduces no-lineal algorithms that recompose the original signal in a purified one, with a considerable reduction of noise, facilitating the distinction of discontinuities inside the whole noisy signal. We have not assumed other processing techniques, like the wavelets. For the selection of the best Time-Frequency (T-F) representation, this study was based on the previous discussed ideas in papers from Jones and Parks (1992) , Chen and Cheng (1996) , and Fukuda and Kitagawa (1996) . As there is not existing a unique T-F representation that guarantees the best resolution, the STFT(Short Time Fourier Transform) was chosen as the simplest and easiest way of T-F implementation. A previous study, with related results, published by Krüger, et al. (1999) , proposed a spectral analysis to distinguish defects induced by hydrogen. In this paper, they finally determined the second order moment, as the best estimator to distinguish this kind of discontinuity. Finally, the papers published at the beginning of this decade, by Stepinski and Lingvall (2000) , Loertscher, et al. (2000) , and Redouane, et al. (2000) , supports the fact of using the STFT like a good resolution T-F representation. II - Importance of the study. Objectives. 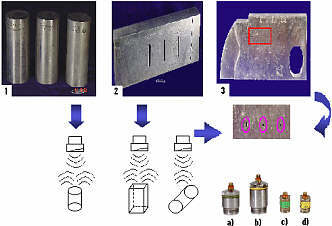 The goal of this study, resides in the possibility of being able to have a methodology, to classify real defects in steels, using the ultrasonic technique. This basic problem has not still been solved totally with the available technology. Establish an effective method for the extraction of characteristics that are common for all defect type and at the same time it allows us differentiate them. Determine an appropriate estimator to differentiate the volume defects from the plane defects, using wideband and narrowband longitudinal waves. III - Brief Theoretical Description. Time - Frequency Representations. The Gabor Transform (STFT). When we want to compare signals using their spectral content, sometimes the use of the FFT (Fast Fourier Transform) is not enough. However, if we could obtain the behavior of spectral components along the signal period, it could be advantageous to obtain additional information on each signal. With STFTf(w,t) is the spectral value of the signal as function of frequency w and of the variable time t, is the window function, f is the function (signal) to be transformed, and t is a time dummy variable. There is a key design question in the STFT, namely the choice of the window size. Once the window size is chosen, all frequencies will be analyzed with the same time and frequency resolutions. In our case a window of 200 points (as a result of trial and error) was used. The whole methodology was implemented using the MATLAB system . The Filter Banks  (Vetterli M. and Kovacevic J., 1995) are the theoretical body of several T-F representations (Wavelets, STFT, etc.). This approach represents briefly, the implementation of a group of filters (that will constitute a complete orthogonal base of a system), specially designed with a variable base (or support) that will be responsible for the coding in frequency sub bands precisely chosen. The "support" has a direct relationship with the subset of frequency components to analyze the signal. where sx is the standard deviation. The most common approach to cluster analysis is the hierarchical method. The method proceeds sequentially yielding a nested arrangement of objects in groups. The hierarchical process can be represented conveniently using a tree diagram. In our study the Dendogram technique [23,24] was used. Furthest neighbor: Maximum distance among the elements belonging to the groups that are wanted to compare. Nearest neighbor: Minimum distance among the elements belonging to the groups that are wanted to compare. Average linkage: Average distance among the elements belonging to the groups that are wanted to compare. III - Equipment, Materials and Methodology. Cylindrical reference blocks for transducer calibration, manufactured by Technisonic Research Inc. in AISI 4340 steel. Each one of these blocks, contain a flat bottom hole with different diameter. Reference block in AISI 1020 steel, manufactured in our institution (1). This block has three rectangular slits with different bases. Standard block for transducers calibration, manufactured by Krautkramer in AISI 1018 steel. This standard belongs to the series Nş 3030 IIW type 2. This block has three side drilled holes with different diameters. The transducers used in this study were manufactured by Krautkramer-Branson. Their diameters were 0.375 in. and 0.5 in., and the fundamental frequencies were 2.25 and 5.00 MHz. The wideband sensors belongs to the Benchmark series, and the narrowband sensors belongs to the Gamma series of the type MSW-QC. The Figure # 1 is a picture of them. Fig 1: Ideal defects used. 2 - Defect type DC. 3-Defect type DB. Used sensors. a)Transducers from serie Benchmark (5.0 MHz, 0.5 in.). b) Transducer from serie Benchmark (2.25 MHz, 0.5 in.). c) Transducer from serie Gamma type MSW-QC (2.25 MHz, 0.375 in.) . d) Transducer from serie Gamma type MSW-QC (5.0 MHz, 0.375 in.). In our study the following equipments were used: a Ultrasonic Flaw Detector USN52 manufactured by Krautkramer-Branson, and an oscilloscope 54610B manufactured by Agilent Technologies. The Figure # 2 is a picture of them. Fig 2: Equipment used. 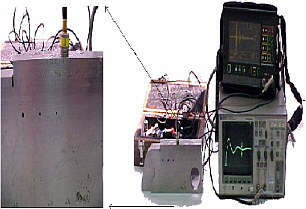 Ultrasonic Flaw Detector USN 52 (Krautkramer-Branson), and an oscilloscope 54610B manufactured by Agilent Technologies. A computer Pentium III was used, with AD/DA PCI 82350 (Agilent Technology) card (GPIB) along with its oscilloscope "driver". The Figure # 3 shows an sketch of the data acquisition system. Fig 3: Sketch of the data acquisition system. The transmission and reception of pulses was carried out using the pulse-echo mode. The signals were received by the Ultrasonic Flaw Detector and then the signal was sent to the oscilloscope. The Region Of Interest (ROI) was obtained adjusting the parameters in the oscilloscope. Then, the adjusted signals were sent to the computer by means of the AD/DA card. Finally the data capture was initialized and controlled from the computer, using an application previously developed in our institution, under the VEEPRO system . Using this implementation the acquired signal was averaged 150 times, to increase the signal/noise ratio. Methodology of Ultrasonic Signal Processing. By the use of the STFT, the representation T-F of each signal of each investigated defect was obtained. In our study the filter bank was constructed using two degree pass-band butterworth filters, where each one (on time domain) allows to extract the spectral content in the interval (i,i+1] in MHz, with i = 0,... ,9. The filter bank was implemented using a program developed in MATLAB system. The signal was decomposed in ten "restricted frequency" sub-signals. These sub-signals were finally normalized before being compared. Fig 4: Matrix representation of statistical estimators for signals (bs01...bs36) and for frequencies sub bands. From each sub-signal were obtained several estimators, to generate a matrix representation including all previous estimators (see Figure # 4). Then, it was applied a discrimination procedure (Dendograms) among these values, using the R system . In this methodology the similarity and dissimilarity measures were used. The general processing methodology is shown graphically in Figure # 5. Fig 5: General methodology for ultrasonic signal processing. Using the above four sensors, the digital signals were acquired, corresponding to nine artificial defects, contained in the three different blocks, obtaining 36 signals. The signals had a total of 1000 points conforming a period of 5ľ-sec, and a sampling frequency of 200 MHz. All the signals were differentiated by the following parameters: defect diameter, defect type, sensor fundamental frequency, and sensor type (wide and narrowband). The selection of the ROI should subtract, the initial impulse, and any other variation not coming from the defect. This selection depends on the distance between the sensor and the defect, the nature of the sensor, the material and the own acquisition data system. Thirty six spectrograms were obtained, corresponding to each one of the studied signals. At the same time, the corresponding dendograms were obtained for all the sensors. They were grouped according to the sensor type and the used estimator. We will present just the most significant results, corresponding to kurtosis estimator. In Figure # 6 the spectrogram obtained is shown, for the received signal from a flat bottom hole defect, using a 5.0 MHz wideband sensor. In the same figure is illustrated the temporal and the frequency representation, both normalized. It is worth to mention the spectral components in T-F representation were obtained approximately from 2 to 10 MHz, which intensity and temporal duration is particular for each questioned signal. Fig 6: T-F representation of signal bs20 corresponding to a defect type DA, with a wideband sensor of 5 MHz. Temporal and frequency representation are also shown (normalized). In Figure # 7 the results of cluster analysis are shown by using the dendogram technique, to the same signal in Figure # 6. All results obtained using kurtosis, from different frequency sub bands were taken into account. The best difference between volume defects (DB) and planar defects (DA and DC) was obtained using the proximity measure of furthest neighbor. This result was consistent for the rest of defects and sensors. Fig 7: Kurtosis Dendogram obtained for the nine signals coming from the nine defects analyzed using the 5 MHz wideband sensor, where the three proximity measures have been used. The estimator that better defines a classification criteria, to differentiate the plane defects from the volume defects according to the used methodology, is kurtosis. The proximity measure that better shows this difference, is the furthest neighbor. This methodology has proved to be consistent and effective, to determine appropriate estimators, to establish a clear difference between volume defects and plane defects. The present results provide encouraging evidence for the potential of this technique to have a methodology, to classify real defects in steels, using the ultrasonic technique. For future work in the area we recommend to reduce the length of filters band and/or the functions that define them. In later studies we will implement this methodology using superior moments. A natural expansion of this study would be to extend the application of this methodology, to real defects, and a greater frequency range. If the results are preserved, the same methodology can be generalized for different propagation modes. This research was supported by Engineering Institute Foundation from Science and Technology Ministry of Venezuela. Whaley H., y Adler L., "Model for the Determination of the Size and Orientation of Reflectors from Ultrasonic Frequency Analysis". 79 th Meeting of ASA. Journal of the Acoustical Society of America, Vol. 48, Page. 102. (1970). Rose J., "Elements of Feature-based Ultrasonic Inspection System". Materials Evaluation. Nş42. Page. 210-218. (1982). Nestleroth J., Rose J., Bashyam M. y Subramanian K., "Physically Based Ultrasonic Feature Mapping for Anomaly Classification in Composite Materials". Materials Evaluation. Nş43. Page. 541-546. (1985). Nestleroth J., Rose J. y Subramanian K., "Utility of Feature Mapping in Ultrasonic Non-Destructive Evaluation". IEEE Transactions, Ultrasonics, Vol. 26. Page. 124-131. (1988). Xin J., Murthy R., Li X. y Bilgutay N., "Detection of Ultrasonic Flaw Signals Using Wavelets Transform Techniques". IEEE Transactions, Ultrasonics Symposium, Page. 1211-1214. (1992). Saniie J., Donohue K. y Bilgutay N., "Order Statistic Filters as Post-Detection Processors". IEEE Transactions on Acoustics Speech and Signal Processing, Vol. 38. Nş 10, (1990). Kaya K., Bilgutay N. y Murthy R., "Flaw Detection in Stainless Steel Samples Using Wavelet Decomposition". IEEE Transactions, Ultrasonics Symposium. Page. 1271-1274. (1994). Xin J. y Bilgutay N., "Detection and Resolution of Multiple Targets Using Time-Frequency Techniques". IEEE Transactions, Ultrasonics Symposium. Page. 1133-1137. (1994). Saniie J., Donohue K., Tagle D. y Bilgutay N., "Frequency Diversity Ultrasonic Flaw Detection Using Order Statistic Filters". IEEE Transactions, Ultrasonics Symposium. Page. 879-884. (1994). Li X., Bilgutay N., Murthy R. y Saniee J., "Spectral Histogram and Its Application to Flaw Detection". IEEE Transactions, Ultrasonics Symposium. Page. 915-918. (1998). Tian Q. y Bilgutay N., "Statistical Analysis of Split Spectrum Processing". IEEE Transactions, Ultrasonics Symposium. Page. 709-712. Li X., Donohue K. y Bilgutay N.,"Adaptative and Robust Filtering Techniques for Ultrasonics Flaw Detection". Ultrasonic Symposium, Page. 1145-1149. (1989). Jones D. y Parks T., "A Resolution Comparison of Several Time-Frequency Representations". IEEE Transactions on Signal Processing, Vol. 40. Nş 10, (1992). Krüger S. E., Rebello J. M.A. y de Camargo P.C., "Hydrogen Damage Detection by Ultrasonic Spectral Analysis". NDT & E International, Vol. 32, (1999), Page. 275 -281. Stepinski T. y Lingvall F., "Automatic Defect Characterization in Ultrasonic NDT".http://www.ndt.net/article/wcndt00/papers/idn393/idn393.htm, (2000). Loertscher H., Bartos A. y Strycek J., "Digital Signal Processing for Ultrasonic Testing".http://www.ndt.net/article/wcndt00/papers/idn210/idn210.htm, (2000). Redouane D., Mohamed K. y Amar B., "Flaw Detection in Ultrasonics Using Wavelets Transform and Split Spectrum Processing".http://www.ndt.net/article/wcndt00/papers/idn589/idn589.htm, (2000). MATLABŇ 6.0.0.88 Release 12. Copyright 1984-2000. The Mathworks, Inc.
Vetterli M. y J., Wavelets and Sub Band Coding, Prentice Hall, Page. 92, (1995). Jobson J., "Applied Multivariate Data Analysis". Categorical and Multivariate Methods. Vol. 2., Page. 345-612. Hair, Anderson, Tatham y Black., "Análisis Multivariante". Quinta Edición. Prentice Hall, Page. 79-121 y 491-531. VEEPROŇ 6.0 Copyright 2000. Agilent Technologies. RŇ1.5.1 Copyright 2002. The R Development Core Team.